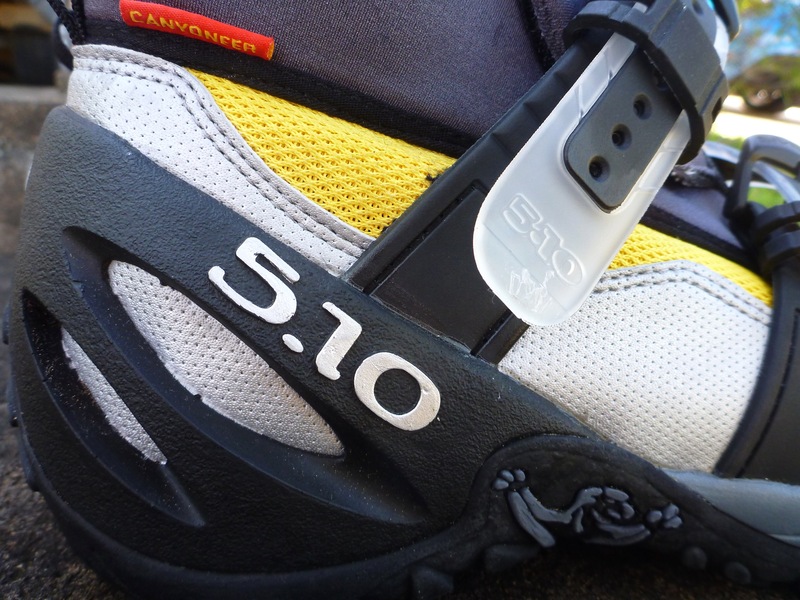 UPDATE: Five Ten is no longer producing specialist canyoning footwear, and has discontinued a number of shoes including the Canyoneer 2, Canyoneer SAR, and Canyoneer 3. The good news is there’s still plenty of great options for canyoners looking for a tough water shoe with great grip. You can see some of the other options we have reviewed here: fatcanyoners.org/reviews/. For decades Aussie canyoners have relied on one shoe and one shoe only, the Dunlop Volley. They offered great grip, were hard wearing, drained well and best of all were bloody cheap! Then the powers that be at Dunlop decided on a redesign, drastically reducing the quality of the shoe while simultaneously increasing the price. I decided to soldier on, because my first new pair didn’t seem too bad, but then the next pair completely crapped out on me during a big remote trip in the Coorongooba Creek area of the Wollemi. Another pair that I was given for Christmas have performed similarly, with the rubber soles worn heavily after two short day trips. Emails to the company by dozens if not hundreds of bushwalkers and canyoners have been ignored. So what’s the alternative? In the last month or two I started looking around at some of the canyoning shoes that are used in the United States and in Europe. I wasn’t the only one, with Joshua beating me to it when he picked up a pair of 5.10 Canyoneer SAR shoes (his very extensive review can be found here, which I recommend reading as he goes through the technical elements of the Canyoneer 2 as well). Within a couple trips he was raving about them, saying the grip was far superior and the sturdiness exceptional. Not just anything can stand up to the rigours of the Aussie bush, but these bad boys seemed to be doing it easily. 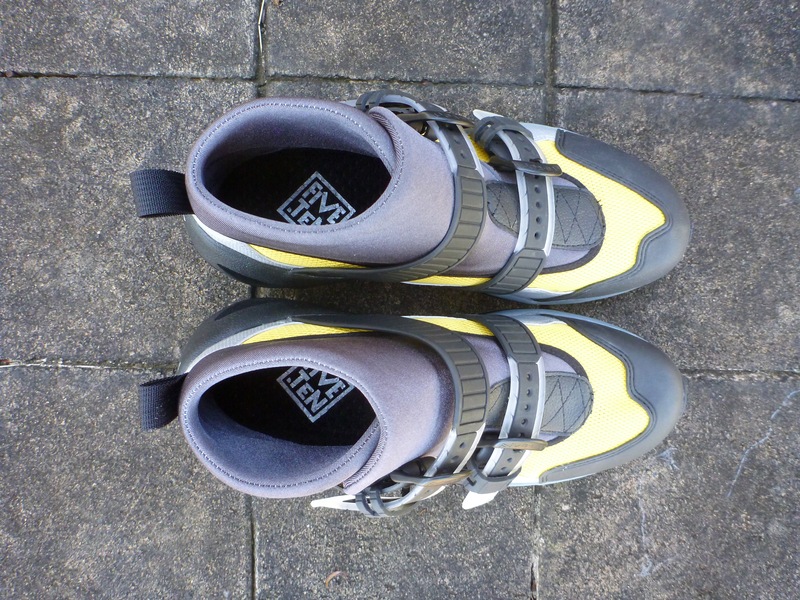 He did raise some slight concerns (no, it wasn’t just that Five Ten has designed some truly ugly shoes! ), such as the stiffness of the shoe and the weird hardened plastic toe guard, but overall they came highly recommended. From what I’d heard from folks in the States, the 5.10 Canyoneer 2 (the yellow ones as opposed to the orange SAR’s) are more popular. While they come with an identical sole, and identical neoprene ankle cuff, they don’t have the toe guard and they seem to be a little more flexible on the foot. Having tried on the SAR in a shop and found some unpleasant pressure on my toes, I figured it was worth going this way. With Utah based canyoneer Deeps offering to pick up a pair for me before flying to Australia (at a price of US$145 which made them even more appealing) I figured the best bet was just to jump on in and give them a go. I’d normally have liked to try shoes out on an easy day trip first, but I was too busy, so the first time they made it onto my feet was day one of a tough weekend trip through some remote canyons near Glen Davis. The first day, which was a very physical 13 hours, was a perfect testing ground. A road bash, a flooded river crossing, slippery river stones, logs, then a long tricky pass through impressive towering cliffs, and all that before morning tea! From there we had some tough scrub bashing, more than a dozen abseils, lots of creek walking, steep slopes back down to the river and even more road bashing. The main part of the sole, made of a harder wearing climbing rubber with a grip pattern that is basically lots of studs, proved to be very good in the slippery mud, which was everywhere. They also performed admirably in lose scree and plant matter. Along the inside of the foot a stickier climbing rubber is used, which provides an amazing level of grip. Obviously this proved invaluable in the canyon, but where it was actually most reassuring was on the second day when we used a rock climbing pass to access our canyon. Given it was raining on and off all morning, the sandstone was very slick in places, and at most times there were huge drops below us, I was very thankful that these babies stuck to the rock perfectly. In the canyon they outperformed the Volley on almost every surface. On regular wet rock they clung, even on those dark coloured rocks covered with a layer of very slick algae they held well. In fact the only surface I could fault them on was smooth, wet logs. Here they did become very slippery, but the easy solution was to simply step over the logs, rather than on them. The one downside seemed to be that because the higher grip rubber is near the big toe, this toe ends up enduring more use that it would otherwise. Every time a rock looked dodgy or I was nervous about slipping I found myself using my big toe as the primary contact point, rather than using the ball of the foot or a completely flat foot. The end result of this, by day three, was some soreness in my big toes, but nothing too serious. I really can’t fault these shoes. Compared to what I’ve used in the past they have as good or better grip in almost every situation. For climbing, especially on slick wet rock, they were great. In muddy or slippery scree conditions they held up perfectly. Best of all, I didn’t suffer any blistering or other problems, despite not breaking them in before a long hard trip. The neoprene ankle cover, while a bit silly looking, does seem to help with keeping out the sand. I definitely had less sand enter, even during river crossings, than I would have normally expected. I didn’t find that they provided much extra ankle support, but it isn’t something I was after, so I was actually quite happy that the high-cut design didn’t feel too restrictive. These shoes drain very well, so no sloshing about inside your own personal foot spa, and go on and off quite quickly. The buckles, which I do kind of worry may be a weak point longer term, also mean no laces coming undone. The Volleys that I threw in the car just in case there was a problem didn’t see the light of day, and I can’t see them making a return. I’m definitely a convert. 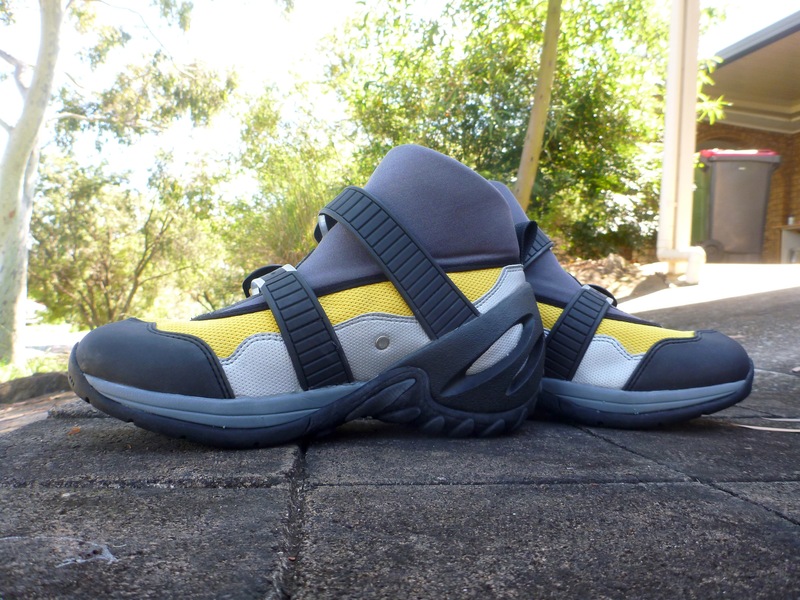 The next step I think is to check out some of the other 5.10 shoes for regular bushwalking, including some that put the identical highly grippy sole onto a regular jogger (such as the Camp Four).